Our Limpet Coil Reactor Vessel are used to control the temperature of the reactants with the help of heating or cooling media circulated through coils surrounding the main vessel. Our Manufacturing facility has been approved by the renowned consultants as we design agitator to suit the reactants viscosity and density. 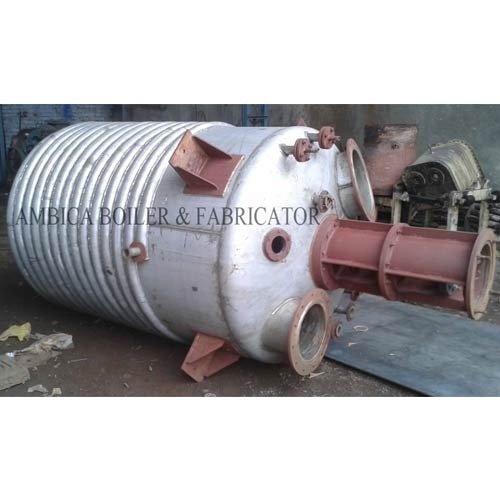 Ambica Boiler And Fabricator commenced its business operations in the year 1991, and today has been reckoned as the most trusted Manufacturer, Supplier and Exporter firm of world class quality Process Equipment And Machinery. Our deepest concerns to bring quality reflect in our offered range of industry proven ETO Sterilizer, Hospital ETO Sterilizer and Autoclave Sterilizer. Our line of next generation products is well favored across the globe for its highly beneficial features of unique cartridge puncturing system, warm and cold cycle facility, simple and safe operation, built in auto aeration facility, power saving performance and competitive price bands. A highly dedicated team of skilled professionals and state of art manufacturing techniques gained us the desired levels of proficiency to listen to the challenging requirements of our valued patrons across the globe. We endeavor to bring forth our stern commitments to quality by developing industry proven designs for low temperature sterilization of moisture sensitive equipment. Further, to achieve highest levels of client satisfaction we are implementing latest techniques and developing the quality tested machinery in manual and semi automatic models. We are engaged in leveraging the best business practices by adhering to the set industry standards, and take pride of our ability to carve niche in selective markets across the globe.